The girl has been named as year 6 pupil Evha Jannath. Witnesses are indecating the girl was standing up and switching seats when the boat was nudged causing her to fall into the water. Her school will also be closed for today. This highlights the importance of listening to all saftey instructions no matter how big or small, and why they're so necessary for our beloved parks and attractions. Thoughts go out to the friends and family of Evha. With greatest respect Emma1999, age restrictions are completely un-enforcable. Children will happily lie about their age if they want to go on a ride. Parents will happily lie about their childrens' age if they deem the ride to look safe for them. I've worked at a theme park and have seen all the tricks tried. Parents putting napkins from fast food outlets into childrens shoes under their heels to boost their height. I have been offered cash by parents to let "too small" children onto rides. That said height restrictions are not clear-cut, as you are invariably measured with your footwear on. Some female footwear [not high heels / stilettos] has considerably thicker & higher heels on than the male equivalent. 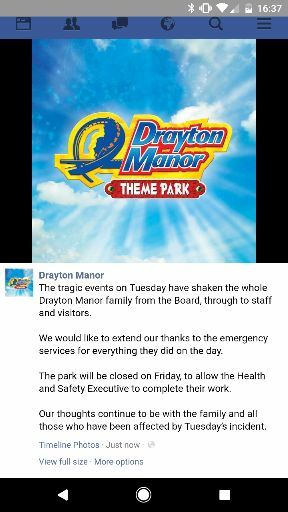 This was obviously a tragic incident at Drayton Manor & I feel for the Bryan family, as I know they care dearly about the park and run it very well. Obviously, my thoughts also go to the family of the deceased young girl. Do we know where on the ride this happened? No disrespect intended to those affected by the accident, but I think it would be very wrong if DMP get into trouble for this if it's the case that the girl stood up. Having been on the ride, there are constant instructions to remain seated, both on signs and over the loud speaker. This is certainly not another Smiler. Here's something out of the Mail which could complicate things slightly. I'd much rather quote the Metro (which is where I read this earlier), but I can't find the online version of the report. Yesterday a mother told of how she warned Drayton Manor bosses about safety risks four years ago when her son fell from the same Splash Canyon water ride. Vikki Treacy said her son Patrick fell off the same ride in 2013 aged 10. He was pulled from the rapids by a member of the public and she had to go to tell staff. She said: 'I just don't think anything has been done since Patrick fell in. If it's that important not to stand then lap belts should be installed. It was an accident waiting to happen'. 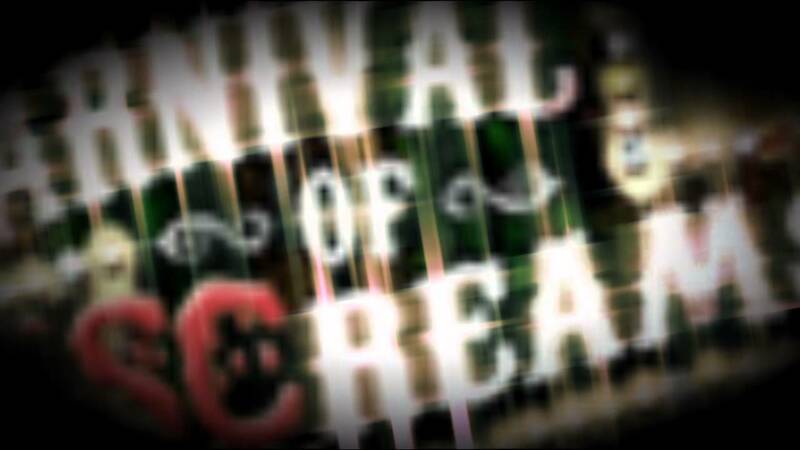 Police and safety officials are investigating how Evha was killed amid claims theme park staff were slow to react. 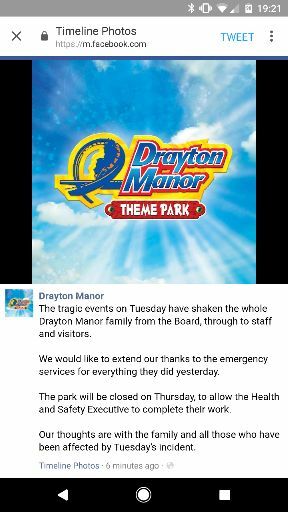 Meanwhile Drayton Manor confirmed the park would be closed again on Thursday 'to allow the Health and Safety Executive to complete their work'. It should be noted that, although this source doesn't mention it, the young boy four years ago has also been described as standing up at the time. This won't help the park's case if it is indeed ruled that the ride was unsafe. I think this is a case of jumping on the band waggon. Whilst I'm not disputing the truth of this statement, I do believe it is being overplayed. If the woman was so concerned then she wouldn't have left it and she'd have seen that the ride was closed/modified. If this ride is unsafe then every other Rapids ride in the world is. This ride has been operating for years with no issue, as has CRR and RR so I can't see the issue. You are told not to stand up so don't stand up. It should be the responsibility of the parents/carers to ensure that the rules are being followed. I struggle to see how this is Drayton's Fault. The parks enforce the rules enough and standing up shouldn't be tolerated. However you cannot monitor the whole ride or even add seat belts because it would rapidly reduce loading times. Also, if a boat ever does capsize, the risk of death is increased dramatically with the installation of a seatbelt or restraint system. I totally agree. My worry was more about the PR side as opposed to the technical implications. As soon as any slight blame is put on Drayton (if it is, which it shouldn't be, if what we've heard so far is true), it's stories like these that will slaughter them. It should be the responsibility of the parents/carers to ensure that the rules are being followed. All things considered, is the unaccompanied height of 1.1m found on all of our major UK rapids appropriate? I don't personally consider it a given that a 5-6 year old (who could easily be 1.1) would be able to go around a rapids ride without supervision and wouldn't be tempted to stand up. So it might usually be ok, but it only takes one out of thousands to misbehave. This would also be a less intrusive way of actually being seen doing something. I think, by 11, one should definitely be considered responsible for not standing up, but I'd personally like to see the unaccompanied height raised to something more appropriate. 1.3m sounds reasonable to me. Alton Towers and Thorpe Park have closed their rapid rides as a precaution. The press will have a field day with that. The press aren't having a field day with anything. Merlin have done the right thing and temporarily closed their Rapids attractions in the wake of Tuesdays tragedy. In the media/GP's eyes this will be a good thing. I genuinely feel sorry for drayton here. This is not the parks fault. I hope this gets resolved soon. Obviously i feel for the family however instructions are clear stay seated. Nice to see merlin have re opened all their rapids today. 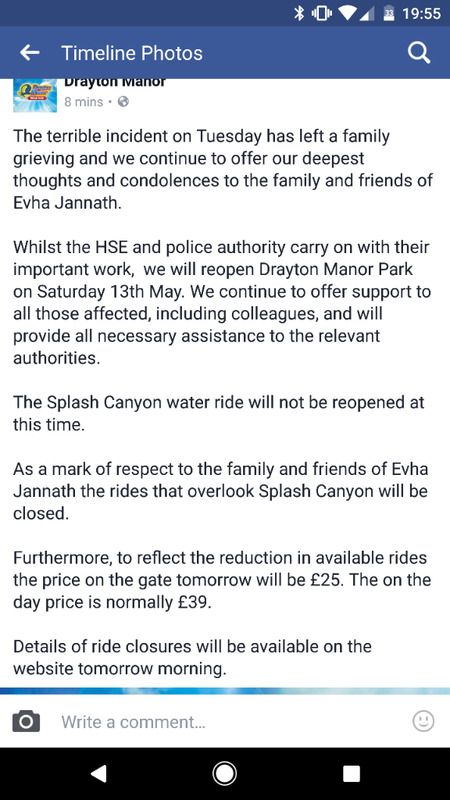 The park have announced that they will be reopening tomorrow (13th May), with Splash Canyon & the rides overlooking it closed. Intresting to see when these rides will reopen. I'd imagine Accelerator, Apocalypse, Flying Dutchman, Yogi Bear 4D and The Haunting will be extremely busy this season if they don't reopen soon with School trips starting. Pandemonium is at the other side of the park? It's good that Alton have posted staff about and made slight improvements to the signage. But this isn't sustainable, they won't pay people to stand there, so this will probably end up with the ride being closed more often or altogether in the future. Maybe an idea would be to install a roof of some kind, like fibreglass pole dome with a slightly camouflaged net on it, this would keep with the theming but allow people to be kept inside if they get bumped about.